I was a little nervous. Brave-eating, to me, is my not flipping the cheese off my burger when they make a mistake and put it on there. Brave-eating, to me, is not panicking when the juice from a ( dreaded ) pickle trickles near my sandwich. Brave eating, to me, is .....well, you get the idea...I'm not brave with food. So the thought of going to a Japanese restaurant had me in a tizzy. The food is, um, weird and I was terrified to try any. But fortunately, they also had Chinese food and I knew I'd be able to find something I could handle. So on a lovely Saturday afternoon, Laura and I pulled into the Dartmouth Wasabi parking lot armed with our MenuJoy gift certificate. What a pretty place. 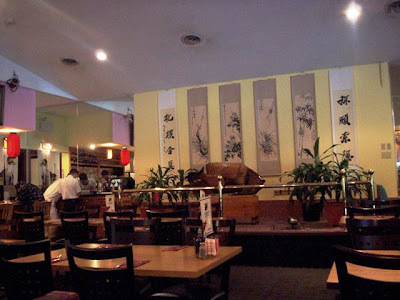 There were lots of booths, oriental decorations, mirrors and even a sushi bar. We were seated at 3 p.m. and noticed a couple of other occupied tables. Our handsome waiter Loen came right over to hand us menus and take our order for 2 Diet Cokes. This is a large menu having both a Chinese and Japanese section. Plus on the wall that surrounds the restaurant there are lists of different sushi, rolls and drinks. Loen brought our drinks and also a small dish of rice chips with duck sauce. Nice. We asked for a few more minutes to look over the menu. I looked over the Japanese side but I just wasn't brave enough. Appetizers included edamame, fried oyster and soft-shell crab ( among other things ). The sushi bar treats included seaweed salad and octopus with vinegar ( tako-su ). Then they have a huge list of sushi and sashimi like tuna, salmon, squid, octopus, eel, flying fish roe and sea urchin ( uni ). Even more impressive is their list of rolls , cucumber, avocado, tuna, eel, lobster and the more familiar California, Philadelphia and Alaskan. Their entrees include tempuras, teriyakis, katsus and noodles. The Chinese section of the menu was much more familiar. 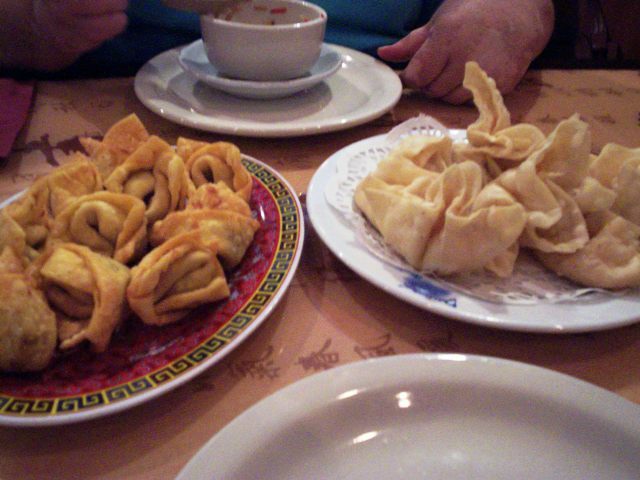 They had all your favorite appetizers like egg rolls, spare ribs, chicken wings, crab rangoons and fried wontons ( and so much more ). 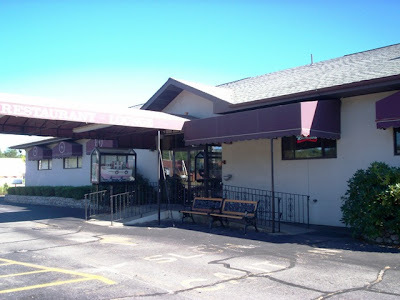 They had soups, chow mein, lo mein, fried rice, egg foo young and veggie, beef, shrimp, chicken and pork dishes ( in all sorts of variations ). 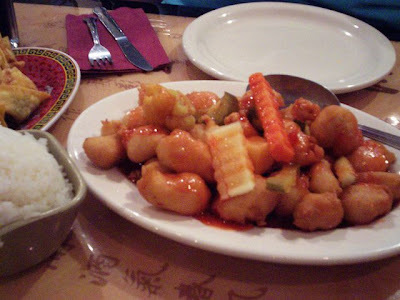 They also carry Szechuan and Hunan dishes which tend to be nice and spicy. You can get their entire menu by clicking here. 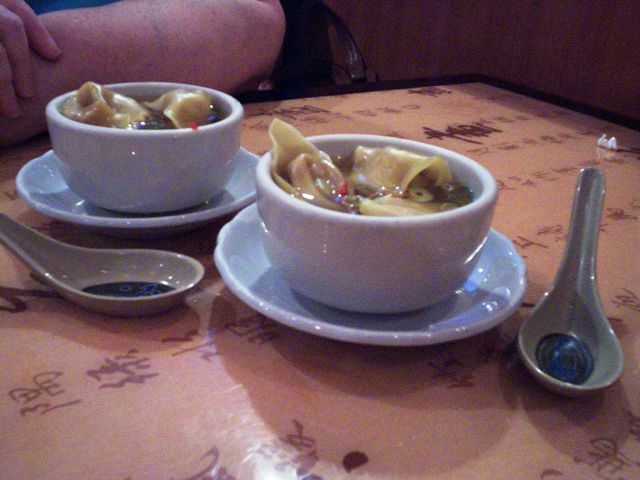 Laura and I both decided to start with a cup of wonton soup. It was warm and delicious. Each cup contained 3 large meat-filled wontons, tiny ringlets of scallion and a seriously tasty broth. We really enjoyed this start to our meal. Plus I was seriously tempted to steal the little "chubby" spoons that came with the soup. Too cute. 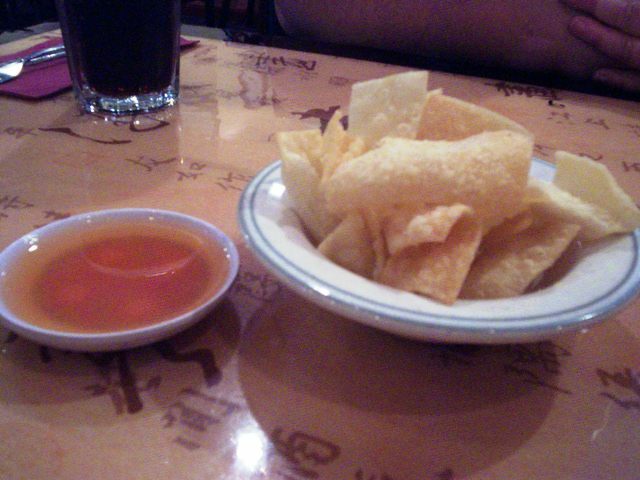 Then Loen brought out our orders of fried wontons and crag rangoons. Both were very well filled and not just all "shell". We loved the very light crispness of the shells on both. They were so delicate and not at all greasy. 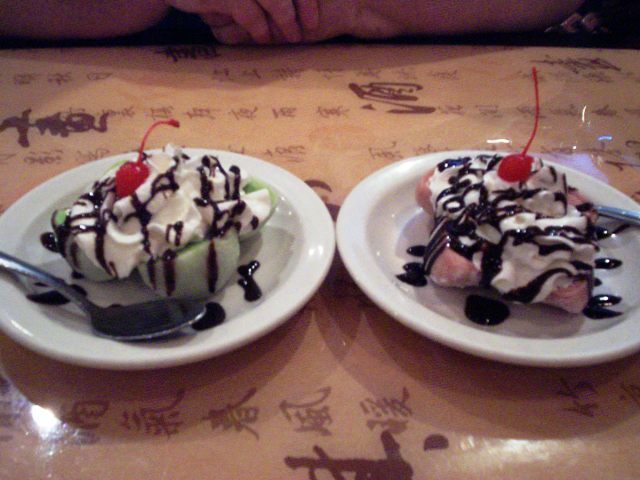 And both orders were very generous. They were terrific. Actually I wish I had some right now, lol. Loen: "Large women ate the ice cream cups." Second waiter: "Not everything is edible." We waited for our bill, full and really pleased that we had come here. Everything we had was very high-quality and fantastic tasting. I'm already looking forward to coming back. Hey, I might get even more adventuresome and get something crazy. I still don't know about the Japanese stuff though. I might need something stronger than a Coke to try octopus. With a 20% tip for Loen , the total was $38. So we left our $10 certificate plus $28 ......great price for a great meal. As is our habit, we visited the ladies' room and found it as spotless and well-stocked as everything else had been. Now what's wrong with this picture ? 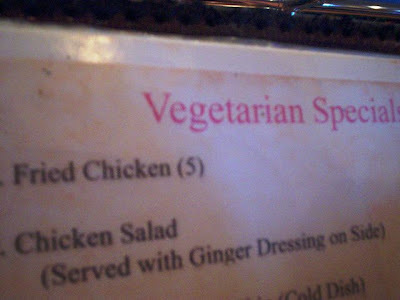 lol Chicken ....vegetarian ? Yes, if it's all soy-based like the bottom of the menu informs us. We thought we'd discovered a HUGE faux-pas. Nope, just us being stupid, again. 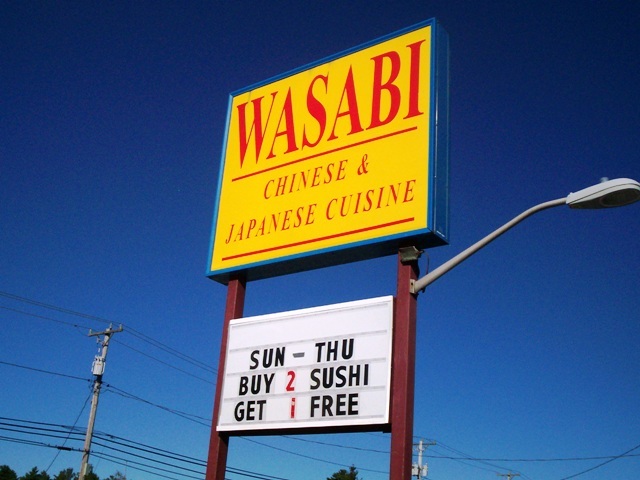 Dartmouth Wasabi is open from 11 a.m. to 10 p.m. Monday through Thursday, 11 a.m. to 11 p.m. Friday and Saturday, and 12-10 p.m. Sunday. If you're using a credit card, please note there is a $15 minimum charge. 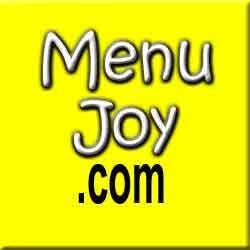 Visit our pals at Menujoy.com for lots of area reataurant menus.